Oh dear, not a single entry for February – v. poor! Not that there is that much to report. I have been tied to the desk trying to get assignments finished for a course I’m trying to complete before the baby arrives. And on that note, I am slowly turning into a weeble incable of bending over for long enough to do anything productive before I ping back into an upright position. We are now experiencing more eggs than we know what to do with. Luckily, there are plenty of people willing to pay for a few, which is a complete bonus because it is probably now covering the cost of the corn and bedding. It may be just a small hint at self sufficiency but I think it counts? 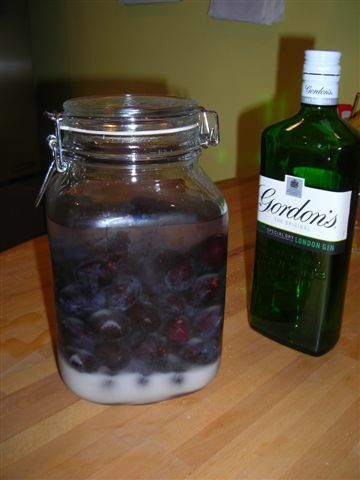 The jar didn’t look very full so I then sloshed in about another 30cl of gin from an open bottle, another couple of handfuls of damsons and another couple of tablespoons of sugar. Obviously not exactly a scientific approach and won’t find out the results for quite some time. All the recipes say shake every day for a couple of weeks until all the sugars dissolved, then leave to mature for 3-4 months before straining and decanting and possibly leaving another 6 months before consumption… I hope its worth the wait! I have been very naughty, starting a blog then completely failing to keep it up to date. Still no apologies, was busy doing other things. broccoli, kale, cabbages, onions, garlic, courgettes, parsnips, plums, damsons, redcurrants, gooseberries, apples (although not nearly as many as last year), some strawberries and a few runner beans. Actually, thats not a bad list for our first year. It is overshadowed by a potato crop completely devastated by slugs, the little tiny buggers burrowed their way in and left a hollow shell. There was a lot of swearing involved in digging them up. Lesson for next year is to plant smaller amounts more regularly and dig them up quick before they get a chance to become infested. The other disappointment was the tomatoes. I know they are supposed to be easy but we never seem to have much success. They never seem to ripen in time and I think they got blighted this year as well. Still, major success at our first village show in July – prize winning biscuits, chutney and courgettes, the only classes we entered! Particularly pleased with the courgettes as they beat the local prize winning veg grower who won every other class of veg. The was much silliness and merriment, dancing with morrismen and entering a bidding war for our own biscuits!! The other major development over the summer was the Amish-style erection of the new chicken shed and the arrival of 3 new chickens in October. May I present: Nora the Explorer, Jemima Puddlechicken and Courtney Clucks who join a less than impressed Gilbert, Ethel and Vera. The late part of the summer and autumn was overshadowed for me by the affliction that is morning sickness. Yes, number 3 is on the way, due the end of April, and did put an abrupt halt on my gardening efforts. Luckily it passed in good time for Christmas and I have enjoyed way too many mince pies and consequently look imminently ready to pop rather than only midway through. Nevermind, will deal with that later. Well, its been a while, but I haven’t forgotten you (Lorna!) so back with an update. Don’t even know where to start. So will start by saying I have done absolutely nothing constructive this weekend. Have been mostly eating, drinking, walking in the rain and throwing coconuts. The good news is that it was our village show this weekend, and our debut year was a complete success. We didn’t enter many classes, not really knowing what it was all about, but won in every one! Andy – first prize biscuits (sorry Pete: third place loser! ); Sarah – first prize beetroot chutney; and perhaps most impressively (because there were more than 2 entries in this class) first prize courgettes. Just watch out everyone, next year we will be back with avengence. PS Note to self, when the hill is in cloud, there is no spectacular view to show the city folk visiting for the weekend; there is just a lot of very wet sheep. I learnt to knit as a child but recently decided to resurrect the skill and its quite sad but I am really enjoying it. So far I have made: hat, scarf and mittens, although the hat turned out a bit small because I used the wrong sized needles – it was for a 4 year old, luckily I also have a 1 year old who it fitted perfectly! Oo and I also made a dress for a Dora the explorer doll and a hooded jacket for a friends baby. Last weekend I had a bit of a session on ebay trying to but some wool or yarn as the knitters seem to refer to it. I went a bit mad in the end. It started off with me losing a couple of bids – who’d have thought bidding for yarn was so competitive? I got very annoyed as I had already virtually knitted at least 3 items with some nicely colour coordinated yarn. Then I got carried away and by Monday I had won 8 lots, which added up to quite a lot of money and quite a lot of yarn. Not a lot I could do about it by then so I have now filled the bottom of my wardrobe with more balls of wool than I know what to do with! This is our record of a new adventure in an old house with a big (ish) garden. We're attempting to embrace all things homemade, homegrown and generally homey.